Ekorian’s Mugie Camp is a private eco camp, owned by Josh and Donna Perrett, exclusively located in Mugie Wildlife Conservancy, Northern Laikipia, offering abundant game and bird viewing. Mugie game drives are remarkable for their intimacy with the wildlife as there are rarely more than two vehicles out on the conservancy. WILDLIFE - Mugie has thriving populations of Lion, Cheetah, Elephant, Impala, Eland, Reticulated Giraffe, Zebra, and the endemic Grevy Zebra, Jackson’s Hartebeest and Biesa Oryx. Mugie’s reservoir plays daily host to herds of playfully bathing elephant; an enchanting scene to observe from a nearby kayak. CULTURE – Visits to local Pokot & Samburu community villages. CONSERVATION - Training exercises with anti-poaching blood hounds. Participation in the Laikipia Predator Project. learn about how more efficient livestock management practices benefit community and wildlife conservation working hand in hand. Ekorian’s Mugie Camp is made up of 6 spacious but cosy tents, each covered by a papyrus roof and raised on wooden decks. Each tent has an en suite bathroom with hot and cold plumbed water and flush toilets.The first tent has a kids annex attached, it’s the perfect spot for small children who are not ready for their own tent.All the lighting is solar powered. There are charging points in reception area. There are no facilities for hair driers and other such like electrical appliances. For a detailed fact sheet on accommodation and facilities at Ekorian’s Mugie Camp, please CLICK HERE. Ekorian’s Mugie Camp has thriving populations of Lion, Cheetah, Elephant, Impala, Eland, Reticulated Giraffe, Zebra, and the endemic Grevy Zebra, Jackson’s Hartebeest and Biesa Oryx. Ekorian’s Mugie Camp reservoir plays daily host to herds of playfully bathing elephant; an enchanting scene to observe from a nearby kayak. Ekorian’s Mugie Camp offers walking safaris as an add on to a stay at the camp, where you can immerse yourself in the culture of the remote Samburu people while hiking through some of the best preserved and most beautiful scenery East Africa has to offer. Meet the Samburu going about their daily lives in the raw forest of the Karisia Hills where stunning views and pristine scenery await exploration. Soak up the guide’s local knowledge of trees, herbs and traditional medicines, and let them show you what their life is really about. Please click here for more detailed information. Josh and Donna are both Kenyan-born and bred. Josh was brought up on a neighboring ranch to Ekorian’s Mugie Camp, and it was here that he learned the art of the bush and developed a strong passion for adventure, wildlife and nature. He trained as a professional guide in South Africa and has worked all over Tanzania and Kenya. Donna was brought up on a farm outside Nakuru. She trained as a chef in Cape Town before returning to Kenya to work in several camps and lodges in Kenya and Tanzania. Josh and Donna are happiest when they are out in the bush, on safari. They both have much experience in the different aspects of safari life and in 2012 they hand sketched and designed Ekorian’s Mugie Camp on a pile of scrap paper with an ethos of ‘simple comfort’ focusing on the authentic safari experience. The plans and ideas started to take shape, and with a team of carpenters, tailors and two sewing machines they completed the construction of Ekorian’s Mugie Camp in time for Christmas 2012. With the view of making as little impact on the environment as possible this semi-permanent, eco-friendly camp is totally solar powered, and has specially designed water-heating boilers. Josh was able to put his carpentry skills to good use and most of the furniture was made in camp with the local dead Olive wood, from which the Turkana name “Ekorian” derives. Ekorian’s Mugie Camp is now very much their home and together with their three young children they look forward to welcoming guests into their ‘home away from home’. George is the Head Guide at Ekorian’s Mugie Camp, George has been apart of Josh’s Family “forever” and was originally taught about the birds by Josh’s Mum. George is an enthusiastic birder with terrific eyesight. He is an avid conservationist and loves to share his passion for the bush. Epak's enthusiasm and friendly smile will make you feel at home as soon as you arrive. Jackline and Steven our chefs, both trained by Donna, have a natural flair for cooking . The both enjoy using fresh ingredients and cooking homely fare. Mugie Ranch is diverse in flora and fauna, the Conservancy in home to. 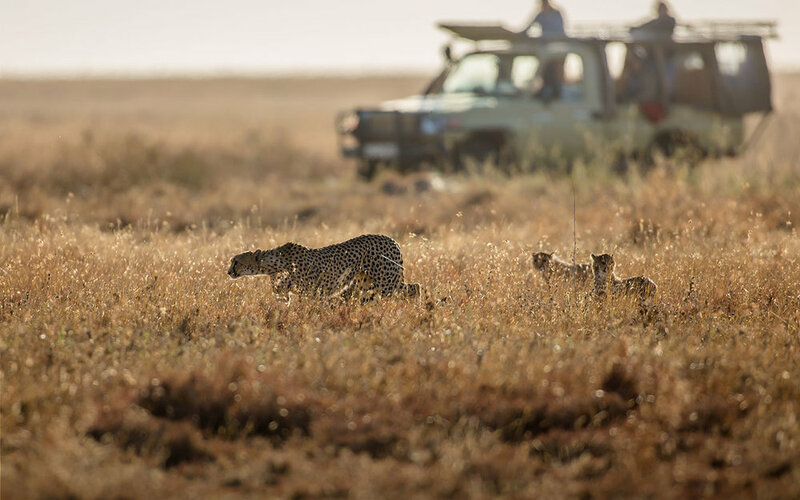 The Conservancy is home to around seventy species of mammals including lion, cheetah, leopard, buffalo, elephant, eland, giraffe, zebra, hyena, impala, and warthog. There are many rare and endangered species residing on Mugie, including the Grevy’s Zebra and Jackson’s Hartebeest. The dam at Mugie was completed in 2009 when the construction of the 500-meter long dam wall was finished and a flash flood filled the dam overnight. As Kenya’s third largest private dam, the reservoir is 156 acres and holds 1.3 billion litres of water. The dam plays a huge role in the ecosystem, providing a year-round source of water, so animals have somewhere to drink, even in the height of the dry season. There is a big population of tilapia and catfish, both introduced, in the dam and so fishing is a rewarding activity. As the border areas of reserves and parks are developed, predators and humans come in to conflict with each other. This conflict is usually due to shrinking habitats and the lions often find the domestic livestock an impossible temptation. So where lions may hunt a person’s livelihood, humans pose a great threat to the lion as they often then kill a lion or leopard out of retaliation. Laikipia District is one of the few areas where people, livestock, and predators co-exist. By studying this co-existence the aim is to further understand how it is possible, and make its continuation feasible by developing and discovering animal husbandry practices and techniques to manage the mutual threats. We also have a fantastic selection of special offers - click here.